Errors in the ammeter-voltmeter method In the circuit just described (Fig. 40.4 (a)) the voltmeter gives the true p.d. across R, but the ammeter reads the current through R plus the current going through the voltmeter. If, however, the voltmeter resistance is very high compared with R the current through the voltmeter will be comparatively small, and hence the error made in calculating R will be negligible. This circuit would, of course, give absurd results if the unknown resistance were of the same order of magnitude or greater than that of the voltmeter. 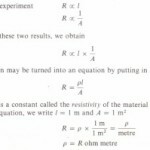 Under these conditions the true current through R would only be approximately half that given by the ammeter. Consequently, the value calculated for R would be about half what it should be. Fortunately the difficulty may be easily overcome. 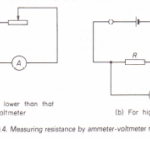 When high resistances are being measured the voltmeter is connected across R and the ammeter together as in Fig. 40.4 (b). The ammeter now gives the true current through R, while the voltmeter gives the p.d. across R. plus the p.d. across the ammeter. If, as is usually the case, the resistance of the ammeter is very small compared with R the p.d. across it will likewise be small, and hence the error made in calculating R will be negligible. Finally, it should be noted that in all experiments to measure resistance the current should be kept low to avoid undue temperature rise, which would increase the resistance (see page 407). For high resistances in particular it would be wise to use a millimeter instead of an ammeter and limit the current accordingly.